From wine country to outback mining towns; lush national parks to world famous beaches. And to top it all? One of the world’s greatest cities. Doing everything New South Wales has to offer could take a lifetime. Staggering beauty, made all the more captivating by the haze of blue eucalyptus oil in the air. Stunning landscapes. Charming towns. 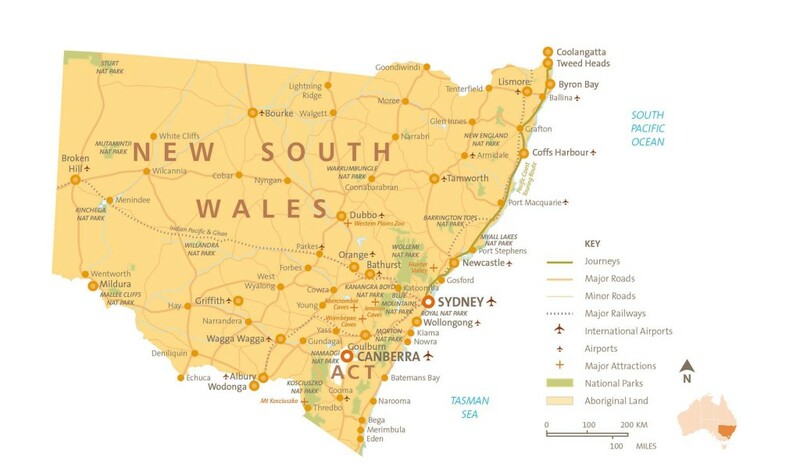 Discover another Australia in and around the national parks of Country NSW. Tour a landscape devoted to wine, then sample the best of it in the restaurants and bars of bustling Newcastle and Lake Macquarie. Plants and animals you’ll find nowhere else on earth, and scuba diving and snorkelling in the waters of the world’s most southerly reef. Pristine beaches and cultured coastal towns line the route from Sydney to Brisbane. Prepare for the ultimate road trip. Aboriginal art, gold prospecting and striking natural beauty. Follow the Darling River and get to know the land and locals of ‘Corner Country’. Skiers and snowboarders love “The Snowies”, but don’t think they’re a winter-only venue. The World Heritage listed Kosciuszko National Park is gorgeous all year round. The perfect year-round destination with an idyllic climate, beaches and national parks. It was Captain Cook who gave New South Wales its name. He had, as far as we know, no connection with Wales, and no one knows whether he meant this to be a new South Wales (in which case, what was wrong with the north?) or a new Wales in the southern hemisphere. In fact, no one knows why he chose to liken it to any part of Wales at all.